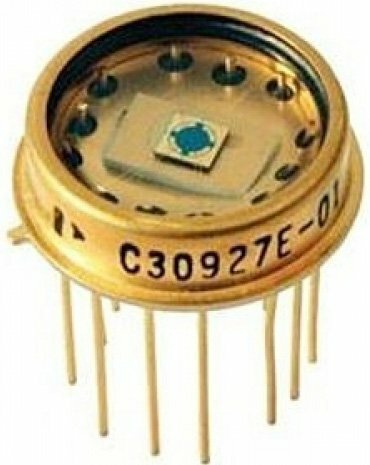 These modules comprise of a photodetector (PIN or APD) and a transimpedance amplifier in the same hermetically sealed package. Having both amplifier and photodetector in the same package allows low noise pickup from the surrounding environment and reduces parasitic capacitances from interconnect allowing lower noise operation. The hybrid amplifier C30659 series includes an APD connected to a low noise transimpedance amplifier. 4 models are offered with Silicon APD and 2 models with InGaAs APD. Standard bandwidth of 50MHz and 200MHz can accommodate a wide range of applications. Two C30659 models are offered with the APD mounted on a Thermo-electric cooler (the LLAM series) to help improving noise or to keep the APD at constant temperature regardless of the ambient temperature. The C30659 can be customized to meet application specific requirements by using one of the Excelitas rear entry APDs, by choosing a custom bandwidth or by qualifying it to your environmental conditions. Pigtailed versions are also available in a 14 pins DIL package allowing nearly 100 coupling efficiency. The C30950EH offers a low cost alternative to the C30659. The amplifier is designed to neutralize the input capacitance of a unity voltage gain amplifier. The C30919E uses the same architecture of the C30950EH with the addition of a high voltage temperature compensation circuit which maintain module responsivity constant over a wide temperature range. Two HUV modules are offered with a PIN detector for low frequency high gain application, covering a broad spectrum range from the UV to the near IR. All optical receiver products can be qualified to meet the most demanding environmental specification as described in MIL-PRF-38534.